I was reading somewhere recently where the author commented on the fact that everyone’s memory does not work the same way. Perhaps one person gets the details of facts while another associates everything with smells. While someone might be able to visualize entire events, others just see a morass when they think back. I should have realized this a long time ago when a school teacher with a flair for experimenting on students quizzed everyone in my class on what we remembered from pages in a book that she showed us. For whatever reason, her point was that some of us had perfect memory of the layout and pictures while others struggled to remember much of anything. She concluded with the comment that people who did well at the exercise tended actually to have poor recall of anything longer than a few minutes. She condemned those of us with so-called “photographic” memories to lifetimes of living in the recent past. In retrospect, I think she just wanted to take some of us down a few pegs. Also, I seem to remember that incident well enough. At least, I think so. Of course, I have no idea what author it was that I mention at the beginning of this abundant paragraph, so maybe that teacher was right. Allow me to digress a little longer before I try to explain what all this has to do with my purported topic. I hold two conflicting fears close at hand most of the time. Years ago, some newspaper article about the Library of Congress pointed out how many books the institution held. Also, they commented on how long a person might need to live in order to read them all. They measured that time in multiple lifetimes. I had never before felt so inadequate. Before the explosion in self-distribution wrought by technological innovation in the last couple decades, I thought I had a shot at consuming most of the great television, film or music. All those ships have long since sailed also. Unfortunately, that sense of inadequacy compounds into a creeping paralysis that leads to surfing the Netflix menu. The second and conflicting fear is that I will discover that everything left unabsorbed is crap. Rephrased, there is nothing new under the sun. In short, I worry that there are too many books and not enough. Who says people can’t hold two conflicting notions in their head at the same time? Wary of wasting my time, I tend to make snap judgments about the potential pleasure that I will get out of spending my time with a particular book or any work of art. If the thing under consideration is free (or seemingly so, like streaming on Netflix), then I will sample it. The other day, we almost made it ten minutes into an execrable science fiction film. Otherwise, I make a choice based on available knowledge at the time. The museum sounds like a reasonable investment of time and money because of the guidebook and word of mouth. The book looks promising because of the blurb and the price is right. 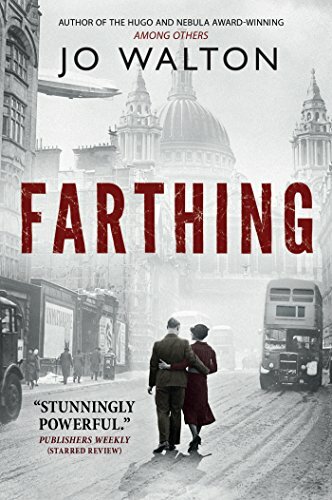 Not so long ago, I stumbled on Farthing by Jo Walton, the first book in her Small Change series. It is an alternate history trilogy about the Second World War. I devoured out and quickly moved on to the rest of the series. I probably qualify as a fan of alternative history books, considering that I have read a remarkable number of them. Even so, I still have a knee jerk reaction to any summary that refers to a potential purchase in those terms.